Adult Education (GED) Classes are starting this month. 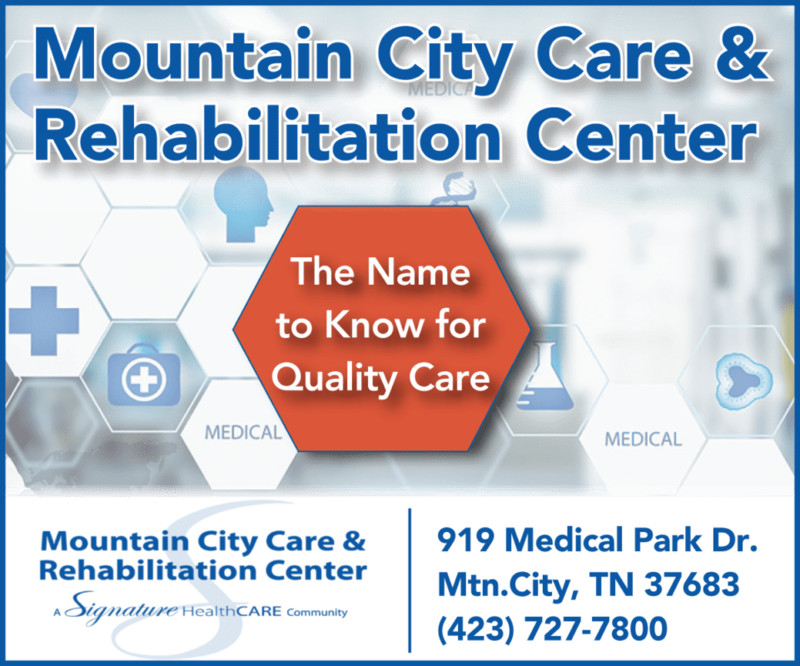 Call (423) 460-3330 or drop by the all-new Johnson County/Mountain City Adult Education Classrooms TODAY- located at 370 Cold Springs Road, at the Department of Human Services Building- side entrance. We have Day and Night Classes to accommodate our working adults! Some students are able to earn their diplomas’ in less than a month! Classes are FREE and HiSet (GED) Testing is FREE! So call (423) 460-3330 or Drop by, and take that first step towards changing your life TODAY! Calling all kids! Santa’s Red Letter Box will be back out in front of the court house starting Wednesday, November 21. Letters mailed to Santa in this mailbox will be delivered directly to the North Pole and will NOT need postage. Children will need to be sure to put their name and address in the letter so that Santa will know who wants what and where to find you! The Red Letter box will remain in place until December 19th. Don’t delay too long, start thinking about your own letter today! MyRide Johnson County is holding a volunteer driver information class/training. November 28 at 2pm at the Johnson County Senior Center. We need more drivers as this program is taking off to a great start! For any current volunteer drivers, anyone interested in how to become a volunteer driver or anyone wanting to learn how the program works please come join us. 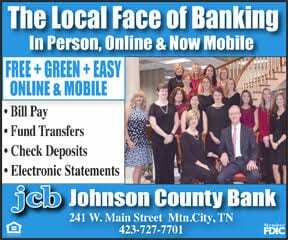 Any questions please call MyRide JC at 423-460-6012. The Johnson County Election Office will be closed December 5-7 for the ESTACEO seminar. The office will reopen on Monday, December 10, 2018. There will be a “Turkey Shoot” on Saturday, December 8 at 1 PM at the Trade Community Center, 228 Modock Road, Trade, Tennessee. Competition will be open to anyone shooting 12, 16, 20, and 410 gauges. Stock arms only. No modified chokes allowed. Multiple cash awards will be offered to winners. Refreshments are available. Proceeds go to maintain the Mill and Trade Community Center grounds and other community projects. For more information, please contact Bill Roark at 423-895-2213. Worley Hall VFW Post 6908 and Auxiliary will meet December 1 for their regular meeting with carry-in meal served at 6 PM and meeting to follow. All members are urged to attend and any active duty military or VFW eligible veteran is invited to attend. VFW Post 6908 is an alcohol and smoke free Post. For further information, call James D. (Don) Payne at 727-7362. Raising grandchildren can be a tremendous challenge. 2.7 million grandparents are now raising their grandchildren. Grandparent caregivers need a support system to help with the many tasks and challenges they face. The Johnson County School System will be hosting its first Things Grandparents Need to Know session on December 3 from 5:30 PM-7 PM in the boardroom at Central Office (located behind the library). Officer Mike Sumner will be discussing drug and alcohol abuse among children and teens. ACTION Coalition will be on hand to offer assistance on how to talk to your grandchildren about drugs and alcohol abuse. Refreshments will be provided. Please come and join us! For more information, contact Edna Miller at 727-2640. The regular December meeting of the Trade Community Center will be on Monday, December 3 at 6 PM at the Trade School at 228 Modock Road. Anyone interested in attending is invited. For more information, contact Bill Roark at 423-895-2213. The Town of Mountain City Board of Mayor and Aldermen will meet in an organizational session on Monday, December 3, 2018 at 9 AM at City Hall. The only item on the agenda is the swearing in ceremony for the newly elected aldermen.The public is welcome to attend. If any additional information is needed, please contact City Recorder Sheila Shaw at 423-727-8005. The Town of Mountain City Board of Mayor and Aldermen will meet in regular session on Tuesday, December 4, 2018 at 6:30 PM at City Hall. The public is welcome to attend. If any additional information is needed, please contact City Recorder Sheila Shaw at 423-727-8005. The Tennessee Sunrise Quilt Guild will meet Dec 8 at 10:00 AM in the Fellowship Hall of the First Christian Church. We will celebrate with our annual Christmas Party and gift exchange. As always you are encouraged to check out our website www.tnsunrisequilters.com to see what we are doing. The December meeting of the Johnson County Democrats has been moved to Saturday, December 15 from 2-5pm and will be held in conjunction with a holiday social at 1935 Dug Hill Rd, Mountain City. For additional information please call 423-440-5689. Johnson County Arts Center- Dec.
Johnson County Center for the Arts is your destination for locally made art and fine craft from the East Tennessee Mountains. You can sign up for scheduled classes or use the materials in our Maker Space anytime. Volunteers are always ready to help get you started. We serve coffee and pastries.“ART is for ​Everyone!” Dec. 5: Ceramic Ornaments 3 PM-5 PM: Decorate your own Christmas ornaments or earrings. Cost is $5 per person and $3 per ornament. Dec. 6: Jewlery Making 4 PM- 6 PM: Learn the basics of jewlery making. Design and create two paisrs of leather earrings to take home. Cost is $25 (Seniors & Students $10). Dec. 7 4 PM – 6 PM: First Friday Show Opening- Silver vs Gold is a community art show in honor of cancer survivors, those fighting now, and those who have lost loved ones. 10% of sales will go to the Johnson County Cancer Support Group. Find out more at the art center! Fri., Nov. 30 & Sat., Dec. 1 at 7pm & Dec. 2 at 3pm; JC Community Theatre & JCHS Players present Annie, the popular musical in which an orphaned child finds comfort and support in the home of NYC millionaire Daddy Warbucks who sets out on an epic mission to find Annie’s parents. Meanwhile, Miss Hannigan, in partnership with her brother Rooster and his girlfriend Lily, attempt to make some money out of this unique situation. The stories become intertwined as the lovable Annie’s story hits the national spotlight. This great show for the entire family provides a wonderful holiday outing and a perfect way to support the arts. Adv seats $10/Dorr $12. For tickets, reservations, group or youth pricing, call 423-727-7444 and leave a message. The Box Office opens on Tuesday – Friday, 12 – 2 pm, 126 College Street. For more information: heritagehalltheatre.org. On Nov 30 at 5pm -8pm Main Street will decorated with lights and vendors and local businesses will be open for business so that you can find that perfect gift for your friends and loved ones. See Santa and get your picture! Come out and enjoy the festivities.Christmas tree lighting 6 PM with special singing.